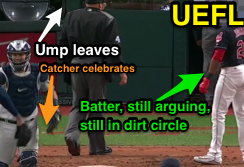 How Cleveland's 2017 ALDS experience ended on an uncaught third strike that HP Umpire Jeff Nelson seemingly made no ruling on inspired some post-series questions by baseball rule aficionados and fans alike. Yankees celebrate a series win over Cleveland. In today's edition of Ask the UEFL, we review just how a game—not to mention a postseason series—concluded with such a play that seemed to go undetected by personnel from both teams, and how common sense and fair play prevailed at Progressive Field during a sequence that could have turned into a repeat of Game Two of the 2005 American League Championship Series...had only the batter noticed. The Play: With two out and one on (R2) in the bottom of the 9th inning of Game 5 of the American League Division Series, with the Yankees leading, 5-2, NYY closer Aroldis Chapman threw a 1-2 fastball to Indians batter Austin Jackson for a called third strike. Replays indicate that Chapman's 1-2 fastball to Jackson, correctly called a strike by HP Umpire Nelson (px -.327, pz 3.461 [sz_top 3.411 / sz_top_true 3.534]), fell out of catcher Gary Sanchez's mitt and onto the ground, upon which Sanchez picked up the baseball and jogged toward the pitcher's mound to celebrate as batter Jackson and umpire Nelson remained near home plate, Sanchez ultimately placing the ball into his back pocket as Jackson argued with Nelson. Analysis and Relevant Rules: First and foremost, we shall establish batter Jackson's status as a runner by citing Official Baseball Rule 5.05(a)(2), which states, "The batter becomes a runner when—the third strike called by the umpire is not caught, providing (1) first base is unoccupied, or (2) first base is occupied with two out." Sidebar: A common misconception is that the batter must swing at the uncaught third strike in order to be eligible to run to first base, but this is not true: the pitch must only be a third strike not caught, with first base unoccupied or two out, and a live ball (e.g., a foul bunt is a dead ball, so the batter is out). For instance, if, with two out and first base occupied, a called third strike is uncaught, the batter may run to first base and if he beats the catcher's throw or tag, he is safe. Naturally, if the baserunner from first base fails to run to second ahead of the throw (now that he is forced to do so by virtue of the batter becoming a runner), then the runner will be out when the base or he is tagged, and the on-deck batter (or his substitute) will lead off the following inning. Nelson views Jackson as the ball is pocketed. Rule 5.04(b)(4) covers a plethora of base awards for when a live ball is batted, thrown, or pitched out of play ("each runner including the batter-runner may, without liability to be put out, advance"), with 5.04(b)(4)(G) proving most relevant to this case: "Two bases when, with no spectators on the playing field, a thrown ball goes into the stands, or into a bench." But that is about a ball exiting the playing field, not entering a player's uniform. Cue Rule 5.06(c)(7): "The ball becomes dead and runners advance one base, or return to their bases, without liability to be put out, when...A pitched ball lodges in the umpire’s or catcher’s mask or paraphernalia, and remains out of play, runners advance one base." Is the pocket out of play? 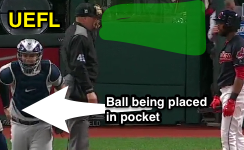 We answered this question in 2016 when Jose Altuve placed a ball in his back pocket as part of a mock hidden ball trick: Yes, the ball is out of play when it enters a player's uniform pocket. Just as Altuve would be prohibited from tagging out a runner, so too would Sanchez. Jose Altuve put a ball in his pocket in 2016. For the precise base award, let's dig a little deeper into the Approved Ruling: "If, however, the pitched or thrown ball goes through or by the catcher or through the fielder, and remains on the playing field, and is subsequently kicked or deflected into the dugout, stands or other area where the ball is dead, the awarding of bases shall be two bases from position of runners at the time of the pitch or throw." This, essentially, is what we have here: a defensive player taking a live ball out of play. The rulebook award is two bases from the time of Sanchez's "throw," as his was a deliberate act of putting the ball into his uniform (and thus, out of play). 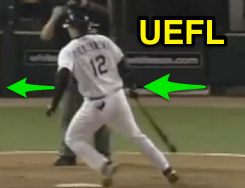 The MLB Umpire Manual agrees: "If, in the judgment of the umpires, a fielder intentionally kicks or deflects any batted or thrown ball out of play, the award is two bases from the time the ball was kicked or deflected." The ball is no longer a "pitched ball" when the fielder gains complete possession of it. By tucking it into his pocket, Sanchez "threw" the ball out of play. Rule 5.05(a)(2) Comment states, "A batter who does not realize his situation on a third strike not caught, and who is not in the process of running to first base, shall be declared out once he leaves the dirt circle surrounding home plate." Rule 5.06(c)(7) Comment states, in part, "If a pitched ball lodges in the umpire’s or catcher’s mask or paraphernalia, and remains out of play, on the third strike or fourth ball, then the batter is entitled to first base and all runners advance one base." Because catcher Sanchez placed the ball into his pocket and out of play before batter-runner Jackson left the dirt circle surrounding home plate, by rule, Jackson is entitled to reach base safely. However, it is wise to consider the General Instructions to Umpires in Rule 8.00: "It is often a trying position which requires the exercise of much patience and good judgment." In 2016, regarding the Altuve play, we wrote, "Take stock of the situation at the moment the ball becomes dead: The runner is standing on second base not intending to advance; accordingly, the proper call is to place the runner on second base and resume play with one out and one on." By rule, Jackson is still not out. 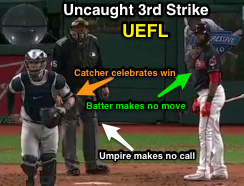 Similarly, although it might be the rules-correct call to disrupt New York's celebration and award two bases to a Cleveland batter (and runner) not expecting to continue the game, the patience to allow the entire play to develop before deciding whether to call the play dead and to impose awards or penalties may lead to better judgment when it becomes apparent that the batter has given himself up pursuant to the spirit of Rule 5.05(a)(2) Comment regarding dirt circle departure. 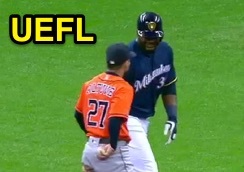 HOWEVER: Unless Nelson ruled that Sanchez dropped the ball during the transfer to his throwing hand after having caught it (in which case the batter was already out), it would have been wise to keep an eye on the play—and batter-runner Jackson—until Jackson exited the dirt circle: even though we speak of common sense and fair play in regards to Jackson giving himself up relative to Sanchez pocketing the ball, Jackson is still not technically out—and should be considered an active runner—until he walks away from the dirt circle or shows no effort to advance. Whether you want to informally deem this a potentially delayed dead ball, or whatever else have you, it still bears mentioning that Jackson determined his own destiny following the uncaught third strike, and had a right to make up his mind until he left the dirt circle. Assuming, of course, that Nelson didn't rule the third strike caught and bobbled on the transfer. AJ runs to first as the Angels leave the field. History: If the hypothetical scenario described above sounds familiar, it should, because it happened in the postseason before. In 2005, White Sox batter AJ Pierzynski slightly delayed his run to first base on an uncaught third strike during the 2005 Angels-White Sox ALCS. The stakes were quite huge here—the game was tied in the 9th—and Chicago ultimately won the contest, due in great part to Pierzynski's post-strikeout maneuver. Though HP Umpire Doug Eddings' uncaught third strike mechanic was hotly debated after the contest—as was the issue of whether the ball actually touched the ground—Eddings' final ruling of an uncaught third strike prevailed, in great part because he stayed with the play.